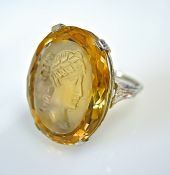 Discover our Selection of Antique Citrine Rings, Estate Citrine Rings, Vintage Citrine Rings and Modern Citrine Rings. 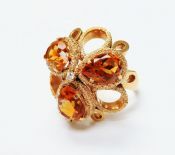 For a Custom Citrine Ring Design Click Here. Citrine is a Lemon Yellow Gemstone and November's Birthstone. A wonderful 14kt yellow gold with silver top mill grain openwork ring featuring 1 round faceted cut deep orange citrine, est. 2.49ct. 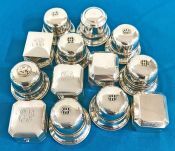 Vintage Birks sterling silver and silver plate ring boxes. Sterling silver $295 each. Silver plate $195 each. 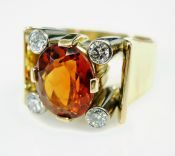 An absolutely fabulous 18kt yellow gold ring featuring 1 cushion cut deep intense reddish orange citrine, est. 6.56ct. A beautiful Art Deco 14kt yellow gold ring, circa 1930, with 1 emerald cut deep orange citrine, est. 3.30ct. One 10 karat yellow gold ring, circa 1910. One cushion cut citrine (23.54 carats). 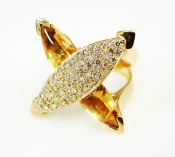 A beautiful vintage 18kt yellow gold ring featuring 1 oval faceted medium intense orange citrine, est. 4.64ct. One 14 karat yellow gold ring. One citrine (0.86 carats). Two citrines (0.30 carats). One 14 karat yellow gold ring. One citrine (3.42 carats). Twenty round brilliant cut diamonds (0.30 carats: SI-I1 carity: H-I colour). One 14 karat yellow and white gold ring. One oval facetted cut citrine (7.07 carats). One 18 karat yellow gold ring. One heart-shaped citrine (2.00 carats). A distinctive vintage 14 karat yellow gold ring with emerald cut citrine, est. 29.25ct. One 14 karat yellow gold ring. One modified octagonal cut citrine (9.73 carats). One 18 karat yellow gold cocktail ring. One emerald cut citrine (44.85 carats). One 14 karat yellow and white gold ring. One citrine (3.97 carats). The ring has a light powedery yellow green enamel frame around the citrine. One custom-made 14 karat yellow gold ring. One citrine (29.79 carats). One 14 karat yellow gold solitaire. One round facetted citrine (16.00 carats). One 10 karat yellow and white gold ring. One citrine (5.53 carats). Four single cut diamonds (0.04 carats: VS clarity: G-H colour). One 18 karat rose gold and silver ring. One citrine (1.47 carats). Thirty round brilliant cut diamonds (0.41 carats: SI clarity: M-N colour). One 18 karat yellow gold with silver top ring. one citrine (11.14 carats). Twenty-six rose cut diamonds (0.19 carats: SI clarity: J-K colour). One 18 karat yellow gold ring. one citrine (14.78 carats). Two rubellites (4.09 carats). One 18 karat yellow gold vintage ball-shaped ring. Forty citrines (7.55 carats).